It’s the time of year again in Gymnazo where we scrap past workouts and start over, innovating the new trimester of workouts. We have almost finished all 60 new workouts, unique to this trimester and likely never to be repeated again. Myself and four other coaches have met repeatedly to wrestle again with programming strategies rooted in science, programming values and client feedback. Each quarter it seems the programming team revisits the philosophy behind our programming strategies and this year we had one key theme come up. We have been contemplating what we ultimately care about, fitness or vitality? This may seem like a redundant concept, but in the movement industry fitness and vitality are very different. There is a vitality, a life force, an energy, a quickening that is translated through you into action and because there is only one of you in all time, this expression is unique. Fitness typically represents the pushing of the body’s many abilities. In more cases than ever before, fitness is pushing the body to the very edge of capacity. Vitality is to command the body’s many abilities at any given time, the power giving continual fitness. Fitness can lead to vitality only if we don’t over stress the systems we use to get there. Just because we can do more now doesn’t mean we always should. We see this mistake being made throughout the industry. Collectively the Gymnazo coaches are unimpressed with fitness trends that emphasis fitness as the sole goal for the everyday athlete. This mindset leads to an incredible routine of high output and high burnout. If you only strive for fitness you’re only pushing faster, harder, stronger and will break down sooner. Our physical exercise shouldn’t beat down the average daily athlete. Exercise should uplift us and give us energy, physically, mentally and spiritually. We want athletes to thrive and not just survive in our workouts. 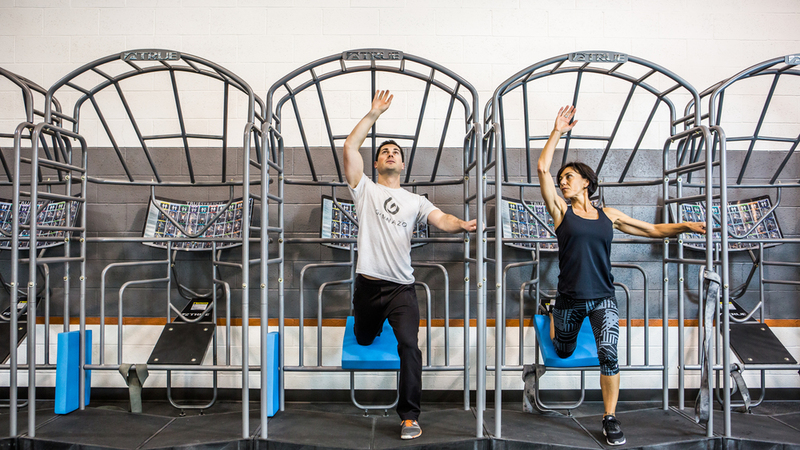 At Gymnazo we have a hybrid approach to traditional fitness: here we equally prioritize fitness and vitality or performance and restoration. It’s one of our key differentiators in today’s fitness mindset. Our team is dedicated to building balanced workouts, advanced in movement literacy and positioned to make any athlete at any level successful. This has far more to do with vitality than just fitness. Whether you are a Gymnazo member or not, it’s vital *pun intended* to evaluate any workout program and determine if it’s a program that balances fitness with vitality. It’s not wrong to want to be fit, to want to push the boundaries of the physical and learn how to harness your mindset and ambition in one focused direction. But if you want to be able to compete at that level for many years to come, prioritizing vitality will be more important. Vitality is the better goal than just fitness. As we program we are reminded that what is easy is not always the best. To program for fitness is easy. Anyone can make something harder but it takes skill and deep knowledge of the neuromusculoskeletal system of the body to program for vitality. The next programming theme we’re working on is advancing our top tier group program into a higher level of performance and benchmarking without sacrificing vitality. Stay tuned! What is True Functional Training?